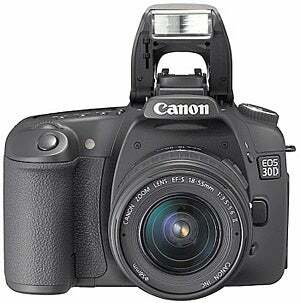 If you're in the market for a new digital SLR you might want to hold on just a little longer until Canon's EOS 30D comes out in mid-March. 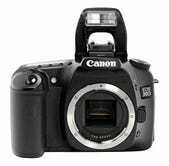 At $1399, it replaces the EOS 20D—now available at a deep discount, if you'd rather spend more cash on lenses. The 20D and 30D are both 8.2 MB, but the 30D does come with lots of lovely new features, including a 2.5 inch, 230k pixel wide viewing angle LCD display, increased burst depth, Picture Style like the EOS 5D instead of the 20D's Parameters, the ability to disable JPEG image sharpening and maybe best of all for tireless shutterbugs like us, lower energy consumption so you can take up to 10% more photos per battery charge.